Internet is a problem in our country but that doesn’t mean startups and tech giants are giving up. While the big news of the week was Google in talks with DTH providers in the country to get the YouTube on your idiot box, the 140 character network Twitter isn’t behind. The company which is all set to file its IPO has extended its service of tying up with celebrities and getting their tweets for free in the form of SMS on your mobile phone. Apart from the celebrity tweets the initiative is focused to the users who don’t have internet or data plans on their phone. The latest Bollywood celebrity to be roped in by Twitter India is superstar Amitabh Bachchan. With an offline fan following that has grown over the years, today the superstar is also one of the most loved star on social media too. If numbers could define his online popularity then his Twitter account has more than 6 million followers and on Facebook he has more than 5.9 million fans. 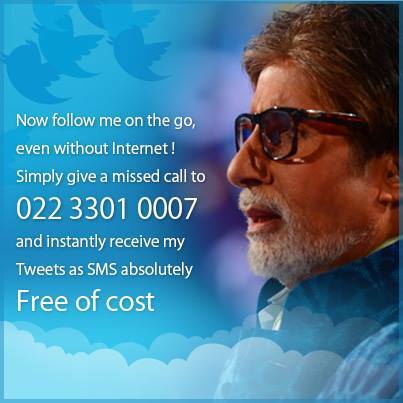 On his birthday which is today, Twitter India along with Zipdial is giving users a chance to get his tweets by simply dialing, or giving a missed call at +91-22- 33010007. The feature works on any phone, any network and moreover it is a completely free experience, irrespective of whether they have a Twitter account or data enabled phone. The star himself has shared the news on his Twitter and Facebook account. Twitter India Marketing director, Rishi Jaitly, who is pleased to see ZipDial and Bachchan use the Twitter platform to extend his reach, had initially launched this initiative with Bollywood heartthrob Shah Rukh Khan (SRK) while the star was at his peak with the massive box office success of Chennai Express. The star has plans to expand this initiative in multiple countries, languages and platforms. The move will surely boost Big B’s fan following and also increase visibility for Twitter, especially when its aim is to expand in emerging markets. I had to face some issues though while deactivating the service on my phone, which I had activated for receiving SRK’s tweets – despite having opted out of the service, I continued to receive tweet messages courtesy Zipdial. Hoping that it has been resolved during this implementation. Twitter India, Aren’t Digitally Signed Posters By Superstars Passé?